Last week Paul Biondich lent me The Starfish and the Spider and I just finished reading it (I know, I didn’t put it in the sidebar). Indeed, a number of people I respect have had great things to say about it – John Lily suggested the book ages ago and I remember reading his review and wanting to pick a copy up. 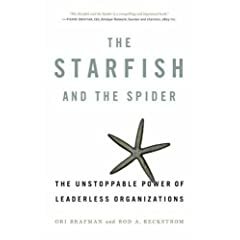 It could be that in starfish organizations the role of managers and leaders isn’t to tell people what to do, but help settle disputes, grease the wheels and make sure that groups are working well. Is this to say other expertise are not needed? Not at all. But it is great to see another take on how soft skills such as dispute management, facilitation, negotiation and mediation may be essential for sustainable success of starfish organization (like open source communities). This entry was posted in book review, negotiation, open source, technology and tagged book review, community management, mozilla, negotiation, open, open source, technology, wiki, wikipedia on September 26, 2008 by David Eaves.